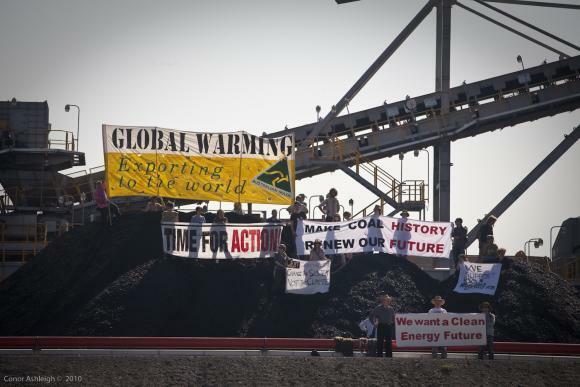 Around 50 Australian climate change activists with Rising Tide closed down operations at the world’s largest coal port yesterday, after entering three terminals and attaching themselves to loaders. Five Rainforest Action Network activists hung two billboard sized banners a downtown Minneapolis skyway during Thursday’s morning rush hour, calling attention to Cargill’s continuing role in the destruction of some of the world’s last remaining rainforests. Some 300 female and male textile workers in the Northern Iranian city of Rasht staged a rally across the governor’s mansion to demand seven months of back wages. A developer bricked up the front of a Barclays bank in Dorset England yesterday to protest the lack of credit available for small firms. In northern Uganda, Limu residents have begun planting cassava, yams, sugarcane, and potatoes in the middle of a road that leads to Gulu University to protest its atrocious condition. A small group under the name of Jamaica Forum for Lesbians All-sexuals and Gays (J-FLAG) gathered at Emancipation Park, a major Kingston landmark, on Friday to protest two recent incidences of knife-wielding thugs carrying out ‘corrective rapes’ of two lesbians.